The Birmingham Hip Resurfacing procedure refers to a hip resurfacing operation using the Birmingham Hip Resurfacing implant, aka “BHR”, manufactured by Smith and Nephew, Inc. The Birmingham Hip Resurfacing is the original modern day hip resurfacing implant, and was first implanted in 1997. It was designed by Derek McMinn and Ronan Treacy, in Birmingham, England, and is today synonymous with the hip resurfacing procedure. The Birmingham Hip Resurfacing implant consists of two pieces, a femoral component and an acetabular component. Both pieces are made of an alloy of cobalt-chromium, one of the most durable metals used in artificial implants today. The acetabular, or socket, component is implanted with a press-fit technique. The roughened, porous, outer surface allows for bone ingrowth when implanted. The femoral component consists of a rounded surface that overlays the prepared femoral head, much like a crown on a tooth. The femoral component is cemented on top of the femoral bone during the Birmingham Hip Resurfacing procedure; other hip resurfacing implants may have a press-fit of the femoral implant. There is a short stem measuring approximately 1-2 inches that protrudes from the implant’s surface; this stem is not cemented and merely allows the implant to be inserted in the proper orientation and alignment. 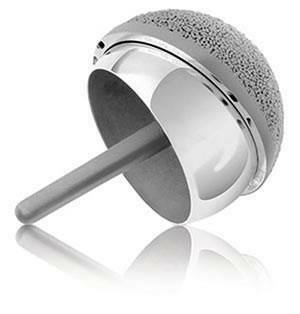 Presently, the Birmingham Hip Resurfacing implant is the most widely used in the world today. Therefore, it has the longest follow up data and most implantations of any hip resurfacing implant available; more than 100,000 have been implanted. Furthermore, the Birmingham Hip Resurfacing has the most scientific studies published about its results. In the national joint registries of Australia, Sweden, and the United Kingdom, the Birmingham Hip Resurfacing has the lowest revision rate of any hip resurfacing hip implant. Certain features of the Birmingham Hip Resurfacing are thought to contribute to its stellar results. The metallurgy of the implant is a high-carbide containing cobalt chromium alloy; the carbides help reduce wear by virtue of their hardness. The Birmingham Hip Resurfacing is made in an “as-cast” fashion, meaning that the metal is not heat-treated after fabrication, which preserves these important carbides. Other hip resurfacing implants may be subject to heat treatments that may deplete the metal of carbides. Finally, the design of the Birmingham Hip Resurfacing includes a highly textured backside surface of the acetabular component, giving it stability; and a relatively high diametrical clearance between the femoral and acetabular components, which may give superior wear properties. These design features of the Birmingham Hip Resurfacing have helped make it the “gold standard” of hip resurfacing implants. Due to the stellar performance of the Birmingham Hip Resurfacing to date, it is difficult to improve upon it in its current form.